All beauty products are not created equal and less does not always mean more. High-end, luxury brands are costly for a reason and usually, that reason is that the product is just better. The ingredients, pigmentation, effectiveness, and application of pricier products tend to be better than its less expensive counterparts. 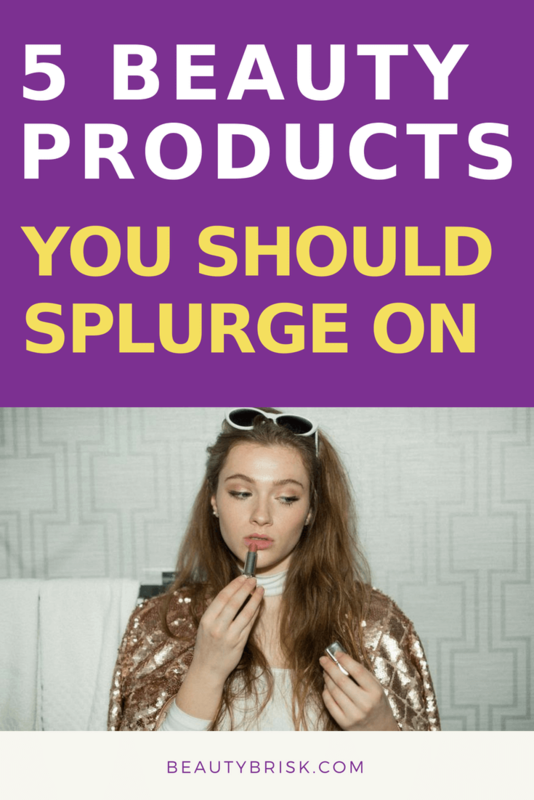 Here are several beauty products that you should absolutely splurge on to get the most out of your beauty routine. When it comes to hair care, you should only use the best. According to a study conducted by Huddersfield University, cheap shampoos may actually cause damage to your hair when compared to its more expensive counterpart. Pricier shampoos contain conditioning agents that control frizz and allow you to go longer in between washes. The study showed that less expensive shampoos can actually increase static cling and cause your hair to attract more dirt. Needless to say, choosing a pricier shampoo and conditioner is recommended if you want your hair to be in better shape. As far as brushes go, choosing a higher-quality brush is highly recommended. Most of the inexpensive brushes on the market are made with plastic bristles that can actually cause breakage and split ends. Some can even irritate the scalp. Boar bristle brushes are becoming increasingly popular, thanks to their gentleness and ability to distribute oils throughout the hair shaft, leading to a boost in shine and hydration. Boar bristle brushes can be quite costly–usually around $50 to $125 and up–but they can last a lifetime, so the investment is worth it. The skin on your face is more sensitive than the skin on other parts of your body. With that said, it’s wise to choose high-quality products that won’t do more harm than good. Choosing a facial cleanser and moisturizer depends on several factors, including your skin type (dry, oily, or combination), skin sensitivity, whether or not you’re prone to acne, and, for the cleanser, whether or not you use waterproof makeup. All of these factors will help you choose a facial cleanser and moisturizer that’s right for you. With so many products on the market, it’s best to choose a product that’s guaranteed to work, instead of one that might or might not. Foundation is literally the foundation of your makeup. Concealer covers all of your flaws and imperfections. There’s no doubt that you should splurge on both of these products. It’s easy to waste money on foundation and concealers because you can’t find the right shade. If you’re unsure of what shade is right for you, visit your local beauty counter and get expert advice. These experts can take one look at your face and determine whether your skin is oily, dry, or a combination. They’ll also have a good idea of your shade. With this information, they’ll find a shade that’s right for your skin tone and skin type. You might find that the recommended brands are more costly. This is because pricier cosmetics usually provide better coverage, better color matches, and other benefits, including pore tightening and extra hydration. So, don’t skimp when it comes to foundation and concealer, especially if you want to look and feel your best. Makeup brushes are an essential part of every beauty routine. They’re used every day and unfortunately, often become an afterthought, as we put more emphasis on the actual cosmetics themselves. Makeup brushes are equally important–if not more important. There are significant differences between high-end and low-end makeup brushes. Most luxury brands use natural hairs in their makeup brushes, whereas less expensive brands opt for synthetic bristles. Keep in mind, however, that there are some vegan and cruelty-free brands out there that use synthetic bristles too, but they’re typically better made. You might find that the cheaper brushes shed and do not provide an even application of makeup (or in some cases, waste a lot of product). Cheap foundation brushes can also be more harsh on the skin and tend to break down quickly (shedding bristles, tops falling off, etc.). If you’re unsure whether or not it’s worth it to splurge on eyeshadow or eyeliner, just watch a few YouTube videos of beauty gurus comparing the two. You’ll find that the high-end eyeshadows are more pigmented and last longer than drugstore brands. As far as eyeliner goes, the pricier eyeliners have tips that provide better control (so that you can get that perfect wing) and are smudge-proof. Some of the less expensive eyeliners and eyeshadows may also contain ingredients that you really want to avoid, such as mineral oil, mercury, and parabens, among others. Considering eyeshadow, if you’re looking for something that’s highly pigmented and will last, then you should definitely splurge a little. High-end designer makeup is on top for a reason. It typically has a better formula, is longer lasting, comes in better packaging, and applies easily. Some expensive makeup and beauty products are worth the investment.